Today there is an ever growing demand for batteries around the world. Due to the rapid development of the industry, the application of batteries in solar energy storage, peak shaving, demand response, portable power, RV, caravan, transportation, communication, power, military, aviation, marine, commercial facilities as well as in the daily needs of our clients has become more extensive on other battery options better than standard lead acid batteries. The performance of conventional lead acid based batteries is less than optimal for peoples needs today. Because of its inherent internal makeup and construction, traditional lead-acid batteries suffer from plate sulphation, active material loss, high water loss rate, poor low temperature performance, short life cycle, poor safety during transporting and other such flaws. In order to overcome these inherent weaknesses in lead-acid batteries, gel electrolyte has been used as a replacement in gel technology batteries. Although it reduces acid mist, reduces water loss rate, self-discharge rate and improves the discharge performance, it also introduces other new problems such as poor penetration of the gel material, weak compatibility with the internal AGM separator (between plates) and a slow reaction to the electrodes (slower response time during heavy charge / discharge events) and also increased heat buildup during high current usage. By way of its different technology Solar Lead-Crystal batteries have a high performance & some unique characteristics. To overcome the fundamental flaws of the lead-acid, gel and standard AGM batteries, organizations we work in conjunction with have successfully developed leading technological innovations in Solar Lead-Crystal Technology. Solar Lead-Crystal Technology batteries are ideal products to replace lead acid and gel batteries for many of the same applications. Solar Lead-Crystal batteries are widely used around the world in regions such as China, Southeast Asia, Africa, Middle East, Europe and other international markets. They are widely used in solar energy, hydro storage and wind energy storage systems, telecommunications, UPS battery backup systems, power stations, railway applications, electric vehicles, electric bikes, beacon signal stations, marine / boating usage and other applications. The unique technology found in Solar Lead-Crystal batteries uses a special advanced technology formula, a new type of Crystalline Silicon Dioxide based electrolyte developed to completely replace the traditional lead acid / AGM battery internal solution. This in turn improves the product application safety & performance. When the composite electrolyte reacts with the plates during the charging process, crystalline electrolyte salts are formed, and the electrolyte is absorbed into the formula. The electrolyte is distributed evenly so there is no increased concentrations in the upper or lower parts of the plates. The electrical properties of the battery are consistent and in turn achieve reliable performance as a result of the more even surface distribution. It effectively overcomes many issues related to plate sulphation, active material loss, water loss and in turn has good low temperature performance and greatly improves product life as a result. Common sizes available are: 12v 7Ah, 8Ah, 9Ah, 10.2Ah, 14Ah, 16.9Ah, 20Ah, 22Ah, 24Ah, 26Ah, 28Ah, 30Ah, 32Ah, 34Ah, 35Ah, 40Ah, 42Ah, 44Ah, 100Ah, 120Ah. If you need any other sizes please enquire with us thanks. Solar Lead-Crystal Technology batteries are a range of new products that were successfully developed based on existing AGM battery style principals (but designed to be much better and do away with many traditional weaknesses with that existing old technology). They has better performance characteristics compared to a conventional batteries and is the result of new technical being applied to give further advantages and extend battery life. The inherent traditional issues of serious lead acid battery acid pollution, electrode sulphation, low life, short battery cycle, poor low temperature performance and other flaws are finally resolved which in turn gives users another option for "efficient, safety and long-life Solar Storage batteries suitable for a wide variety of applications". Charger settings for most 12v Solar Lead-Crystal Technology Batteries. Solar Lead-Crystal Batteries are high-end products that work best with quality battery chargers that are setup with the correct charge profile settings to suit this battery technology. Settings below are for automated battery chargers are recommended to suit most Solar Lead-Crystal Technology Batteries. • Cyclic charging: the battery is frequently charged and discharged like a daily routine. The battery is boosted to a higher voltage, followed by an equalization phase at lower voltage and lower current, automatically followed by the float phase when and if the battery is (close to) full. • Standby charging: the battery is only discharged once per week (or less). • Float charging: the battery is in a constant charged state and rarely discharged. The Float Phase will also set in on standby charging when the battery is full (fully automated). Battery Capacity vary under certain discharge conditions in terms of how much energy can be released relative to the current draw. The amount of current released is called the battery capacity and the symbol used to identify this capacity is usually written as "C". The commonly used unit of measure is Amp Hours (Ah) for short. The battery capacity can be defined in two parts, namely rated capacity and actual capacity under different discharge conditions. The actual capacity of the battery under certain discharge conditions is calculated by the current (A) multiplied by the discharge time (h). The resulting unit is Ah. The battery discharge rate uses rated hours to determine the discharge time. This time is influenced by the amount of current drawn from the battery. If the discharge current increases, the discharge time will decrease and also affect the rated capacity. Please see above a generic curve of different discharge rates of a Solar Lead-Crystal Battery at 25°C. 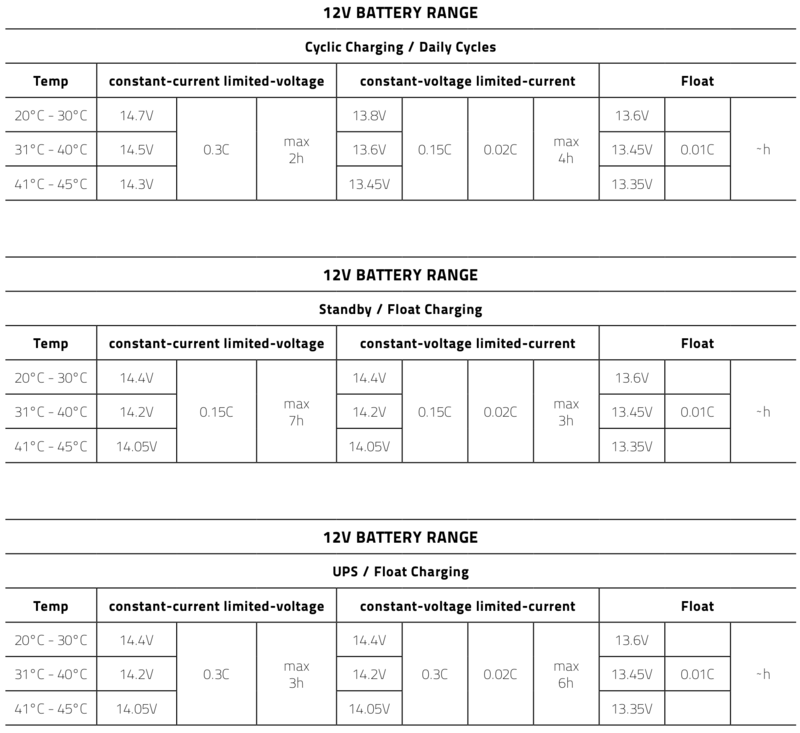 For discharge values of a specific battery model we revert to the constant current discharge tables in the datasheet. The discharge characteristics and temperature of batteries are closely related. When the temperature is low, the discharge capacity of the battery will be reduced. For example, when the temperature is dropped from 25°C to 0°C, the capacity of the battery will drop to about 95% of its rated capacity. 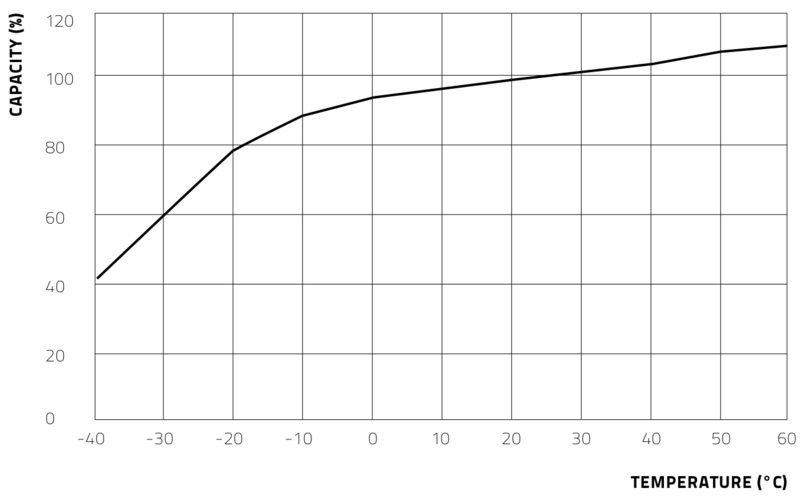 As the ambient temperature rises, the battery capacity will increase within a certain range, for example, the battery capacity will rise to about 105% of the rated capacity when the temperature rises from 25°C to 40°C, however if the temperature continues to rise, the capacity increase will slow down, and ultimately not increase further. The termination voltage refers to the battery voltage dropping during discharge to the minimum working voltage required for operation. The termination voltage and the discharge current are closely related. Generally during high current discharge the termination voltage of the battery should be set lower. During long term operation at small discharge currents, the battery may form a thin layer of sulphation on the plates, increasing their size. This could cause deformation of the active material and can cause it to fall off the plates. To prevent this and to protect the battery during small current operations, the termination voltage should be set slightly higher as a result. Over discharging below the termination voltage should be avoided since the over discharging could only gain a small amount of additional capacity, but drastically reduce the battery’s service life. Termination voltage of Solar Lead-Crystal batteries when discharged at different current. The self-discharge characteristics of a battery changes with environmental temperatures, the higher the temperature the higher the self-discharge, so the batteries should not be stored in an environment that is subjected to extremely high temperature conditions for long duration's of time. Due to the use of our unique crystal composite electrolyte and alloy grid plate technology, the self-discharge consumption of Solar Lead-Crystal Batteries is efficiently reduced. At a constant 25°C environmental temperature Solar Lead-Crystal Batteries can be kept on a shelf for up to 1.5 years without constant top up charging. The batteries will maintain around 80% of their rated capacity after 12 months of being stored. Note: The following information above is GENERIC to Solar Lead-Crystal Battery Technology and is NOT specific to 1 particular brand, make or model lead crystalline technology battery. We are not associated with Beta Batteries or trying to claim to be associated to Betta Batteries or there products, hence making this very clear here with this disclaimer.